One of the worst side effects of being stuck at home with a broken leg is that you are pretty much homebound. You can’t go anywhere, well you can although everything becomes a crazy obstacle course. Everything has to be planned well in advance. Stairs turn into major hazards. Streets are adventures to be crossed and subway stations, with their run-of-the-mill escalators or worse, lack of them become simply dangerous. In fact, of the few times I have gone out, the highest ratio of close calls where I could have seriously fallen and re-broken my leg where at subway stations. There are tons of people everywhere, the floors can and tend to be slippery and just imagine trying to carry food, or any dead weight using crutches while not being able to bear any weight on your right leg. Not to mention I live half a kilometer from the nearest subway station. So that means that anywhere I go, I have to crutch my way at least 1km for a return trip. Now that is some serious non-fun. A few months ago I had joined YELP for fun and I was doing well as a top Yelper but I only visited the site sporadically. Being mentioned in their newsletter was good and dandy but after my accident, I began writing again, you know, to help me keep busy and drive me less crazy. What is Yelp you ask? It’s a site where people review businesses, restaurants, fast food joints and help out others who might for example be wondering whether that Mexican place on St. Clair is any good (is not). So you write reviews for your fellow man in hope that when it is your turn to wonder if that new sushi place in the Annex is any good that some fellow Yelper might have you covered and wrote a review that might help you out. 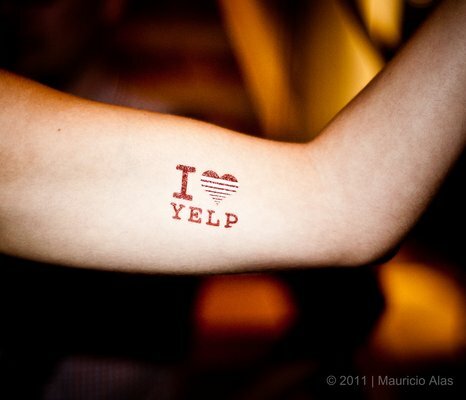 So I thought I might be able to add a few reviews here and there… You see, if there is one great thing about being an event organizer for 4000 people is that over time you do get to visit a lot of businesses and that is what YELP is all about. So I began writing some reviews and all of the sudden I was nominated to become a Yelp Elite! What does that mean? I think it is an icon they put next to your profile to show people how dedicated you are. Now the most awesome thing is you get invited to this Elite only parties where the food and drink are all paid for. NOW YOU ARE TALKIN’… However, with a broken leg is not like I am going anywhere yet. BUT the one good thing is I have had the chance to make some new friends, and help out the Toronto community! Now I am only up to 52 reviews but I am hoping, after having joined the 30-Day Review Challenge to hit my goal of 67 by the end of the month! …And keep my sanity. In the end, it is a good website, so click over if you would want to check that new restaurant you have been hearing about! Below is a map of my latest reviews! PS:. If you read this after 10/12/2011, chances are you will see a lot more locales!